The power inverter with dual 100V household electrical outlets provides enough power for your laptop, digital camera, TV, fan, refrigerator, game console, DVD/Blu-Ray player, GPS, lamps, and more. Additional 4 USB ports, can charge your phones, iPad, tablets and other mobile devices for multiple charging purposes and emergency situations. 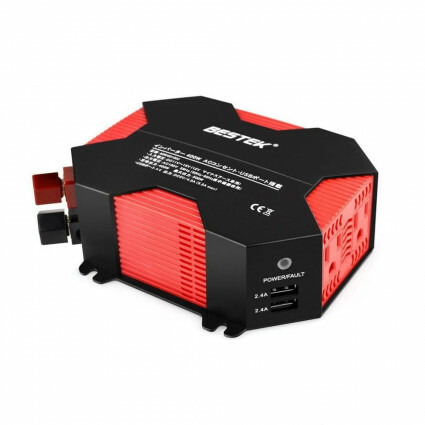 As America’s first power inverter brand, BESTEK inverter has the highest performance. This 400W inverter can provide 400W continuous DC to AC power and 1000 watts of peak power that can meet both low and high power electronics. Dual 110V household electrical outlets provide enough power for your laptop, digital camera, TV, fan, refrigerator, game console, DVD/Blu-Ray player, GPS, lamps, and more. 5A/ 4-Port USB charging ports make this power inverter ideal for charging your phones, tablets, and other USB-powered devices. You can charge 6 devices simultaneously at the fastest speed automatically. Apart from 2 AC outlets and 4 USB ports, the voltage transformer also comes with 2.3ft car cigarette lighter plug and 2ft black/red battery clips to plug into your cigarette lighter or connect directly to your vehicles battery. With one this power inverter in car, no worry about power off anymore. Small sized and ultra-light, this power inverter is portable to carry on and store without occupying space, ideal for trip, travel, camping, business or any places where there’s power off. AC outlet, USB port, and cigarette lighter plug allow different electronics charging, plug and play, very convenient. Built-in 20 amps Fuse & Cooling Fan with Full-Protections including low battery alarm, low battery shutdown, overload protection, short circuit protection, (Applied for a 12V car but not 24V), the voltage supplier can ensure your devices and family in a safe situation and make it a long lifespan, saving money. • Converts DC power in your 12V batteries in your car, truck, boat or any other DC power sources into the AC power that home appliances, electronics and tools need. • Always tighten the Positive (+) and Negative (-) terminals when the inverter is in use otherwise a loose connection can overheat due to poor contact. • Always make sure that the total rated power of the connected devices is less than 400W. • Avoid placing the inverter in a location that receives prolonged direct sunlight or near to heat sensitive materials as the inverter can become warm during use. 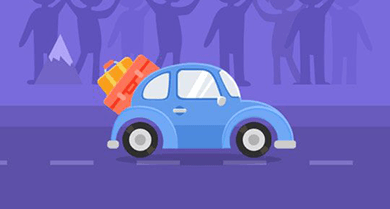 • If the rated input of any connected AC devices exceed 150W use the included battery clamps to directly connect to your vehicle's battery as most vehicles 12V ports are rated and fused for 150W.